AMD FreeSync technology is apparently now official, bringing an alternative to Nvidia’s G-Sync. Both technologies are implementations around the industry standard DsiplayPort specifications in their revision 1.2a and more specifically around the DisplayPort Adaptive-Sync. AMD’s implementation however does not rely on expensive hardware DRM module like Nvidia (the G-Sync module itself), so it should not increase the price of the display additionally. 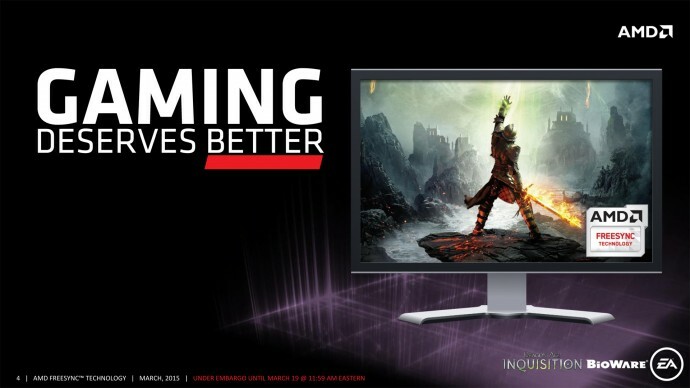 In theory AMD FreeSync should work on all DisplayPort 1.2a-equipped monitors if you have a compatible AMD GPU, though the company is not very clear on that subject. The list of compatible AMD GPUs with gaming support for FreeSync include AMD Radeon R9 295X2, 290X, R9 290, R9 285, R7 260X and R7 260 (the status of 7800 and 7900 series or 280X is not very clear). Update: After trying out Acer ХВ280НК 4K G-sync monitor with AMD Radeon R9 280X and 290X I can say that I’m not very happy with both AMD and Nvidia. The G-Sync monitor works just fine on Nvidia hardware with G-sync and without. On Radeon 280X (not officially compatible with FreeSync according to AMD!) the monitor works just fine, but no option to enable FreeSync in the drivers as expected. Connecting the monitor to a AMD FreeSync compatible GPU, namely Radeon R9 290X the drivers still show no option to enable FreeSync in the drivers, nor the display is detected as capable of supporting it. The problem with Sapphire R9 290X 8GB and the Acer ХВ280НК monitor is that the display is not working properly in this combination, there is picture, but the monitor constantly goes blank for a bit at irregular intervals, just as if it is loosing the input signal and getting back signal – happens in both 2D and 3D mode. The tests were performed using the AMD Catalyst 15.3.1 Beta drivers supplied by AMD for trying out the new FreeSync feature. Update 2: It seems that if you want to be able to use AMD’s FreeSync technology you would still have to buy a new display that features DisplayPort 1.2a interface and also buy a new graphics card if you are using R9 280X, one of the most popular GPUs from AMD. 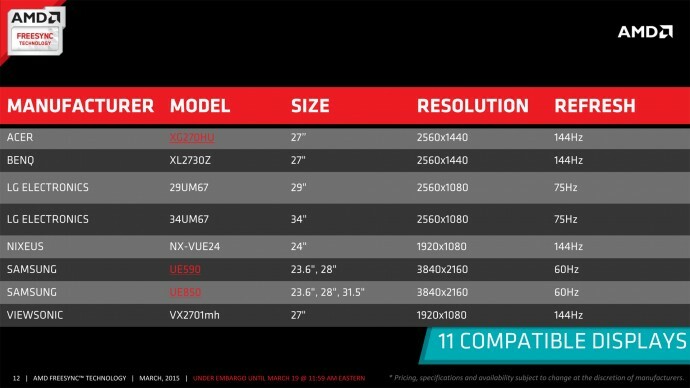 It will not work on your older hardware as most likely you don’t have DP 1.2a capable monitor anyway, unless you bought a really recently announced model, so you might want to wait for one of the new gaming models that are officially compatible with FreeSync as listed by AMD. Also since Nvidia’s G-Sync technology uses DisplayPort 1.2 interface the officially licensed G-Sync monitors will apparently not work with FreeSync as well.